The fruits of my compost pile. So you don’t like mushrooms because the texture is like a slug. I can help you with that: How to properly cook mushrooms. 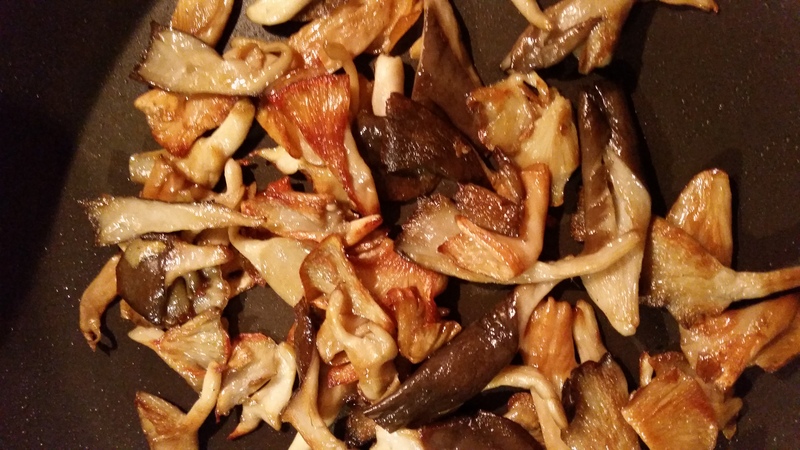 November 9, 2015 / Amy Fox / Comments Off on So you don’t like mushrooms because the texture is like a slug. 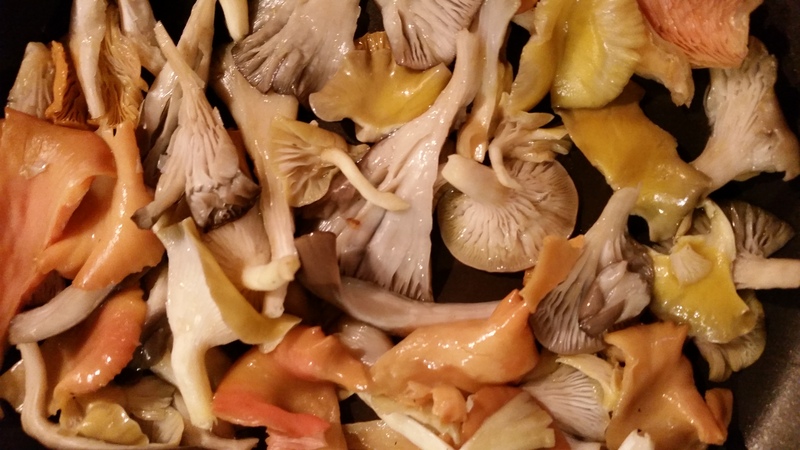 I can help you with that: How to properly cook mushrooms. 2) Those that are curious and walk by my booth as if those “flowers” or “seashells” might jump off of the table and bite them. Yes, many a time I have had people ask me if I was selling flowers or seashells. : ) The fellow fungiphiles need no indoctrination into the world of the incredible mushroom but I absolutely love, love, love bringing those that are wary in with a bit of friendly convo, only to convert them to my mushroom loving ways. See, it is not about the money (although I do love me some greenbacks…they pay the bills), but more about opening people’s eyes to the world of edible fungi (that is composed of more than the common white button, cremini, or portobello mushroom….all Agaricus species). When I rope in the leery lady/gentleman, the first question I ask is if they like mushrooms. I either get a yes or a no. If no then I ask if it is the flavor or the texture. If they state that they do not like the flavor, I apologize and tell them that I have nothing in my bag of tricks to remedy that dilemma. If they state that they do not like the texture, I rub my palms together in anticipated victory and commence to educating them on the proper way to cook a mushroom. Unless it is a dense mushroom such as a white button or porcini, I prefer tearing the mushroom to the desired sized pieces. 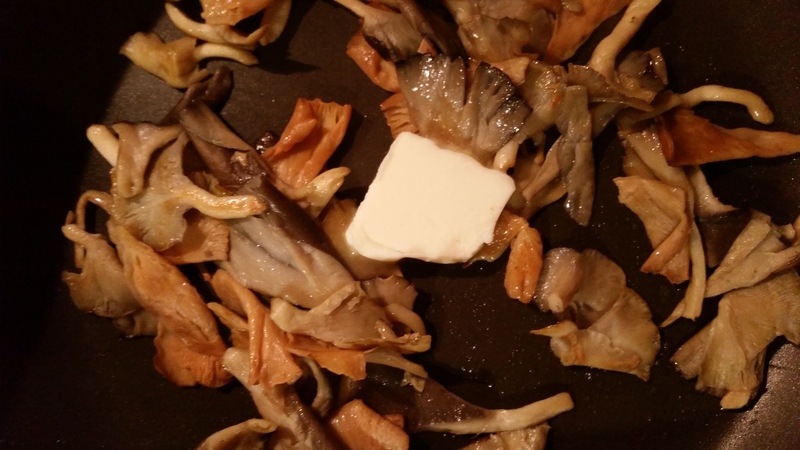 Most people, myself included until I was properly educated, cook mushrooms incorrectly. See, most mushrooms are mostly water by content. Most of us have this knee-jerk reaction to add oil or butter to the pan immediately with said mushrooms as if they were diced onions. That is our biggest mistake and that leads to that slug-like texture that people detest. First off, I never cut mushrooms with a knife unless it is a dense mushroom such as a button, cremini, portobello, porcini…… Instead, I tear them into the desired sizes. Secondly, I prefer a nonstick skillet but if you prefer the old standard, just know that you must add a little lube when you add the shrooms to the pan in the form of butter or oil so that they do not stick. Notice that I used the words, “a little”. Lets get this shroom cooking party started!!! Remember when I said that mushrooms are mostly water? That holds true for most of them across the board. 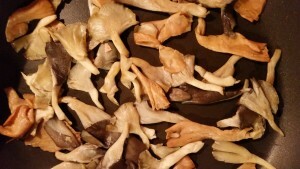 There are exceptions though such as hen of the woods, lions mane, and chicken of the woods that are more dense and do not release as much water when cooking. Oyster and white buttons though are gonna sweat like a man wearing a winter coat on a hot NC summer day. When the mushrooms first release their water, you will see the tissue start to glisten. Considering that info, always start cooking your torn or sliced shrooms over low to medium low heat (depending on how hot your stove is). DO NOT ADD ANY BUTTER OR OIL!!!! I know you want to , but control yourself! You are gonna know within the first few minutes (or less) if your mushroom is going to sweat or not. If it does not release moisture but instead immediately sticks to a nonstick (or lightly oiled pan), then chances are it has a lower water content and will require the butter or oil added at this point. For the purpose of this lesson, let’s focus on a higher water content mushroom: the oyster mushroom. After three flushes, I recycle my oyster mushroom bucket substrate by tossing it onto my compost pile. 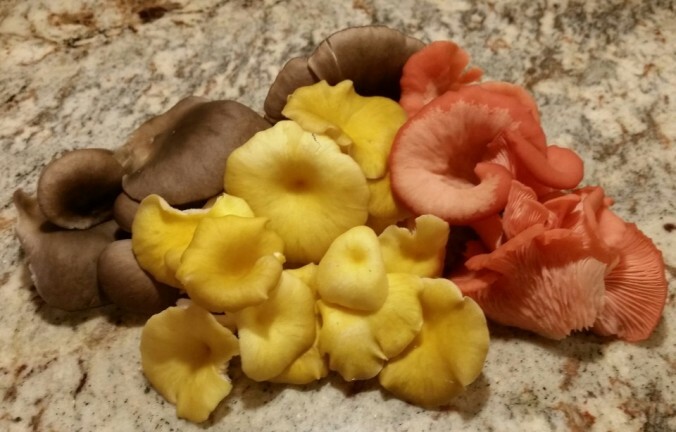 Let’s just say that the deer and squirrels that frequent my backyard are spoiled by being provided gourmet edible mushrooms as part of their daily diet. They are not the only ones that enjoy them. 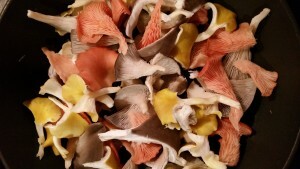 My customers are the recipients of the shrooms that grow in my climate controlled fruiting chamber but I am happy to partake of the fruits of my compost pile for my own personal use. The beautiful palate of colorful oyster shrooms that you see pictured in this article were harvested from my compost pile and they had just experienced two days of rain. Hence, they were a tad bit more full of moisture than usual. 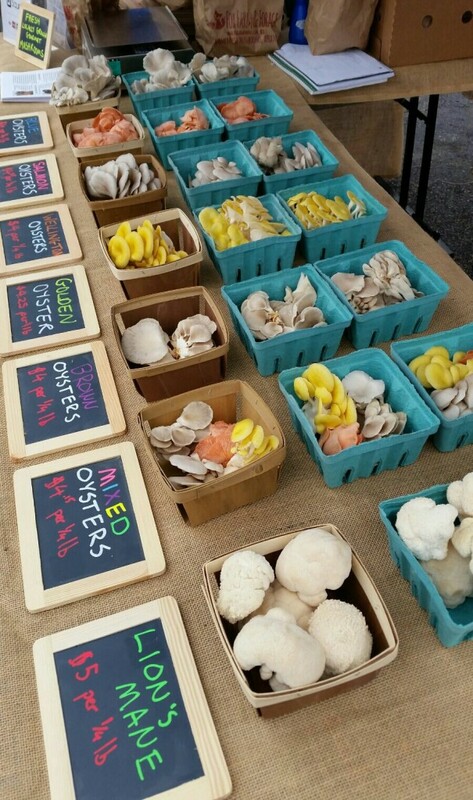 Pictured are oysters who have released all of their moisture. Regardless of the amount of moisture contained within the tissue of the mushroom, the process is the same. Let it release in the pan and then allow it to evaporate out. 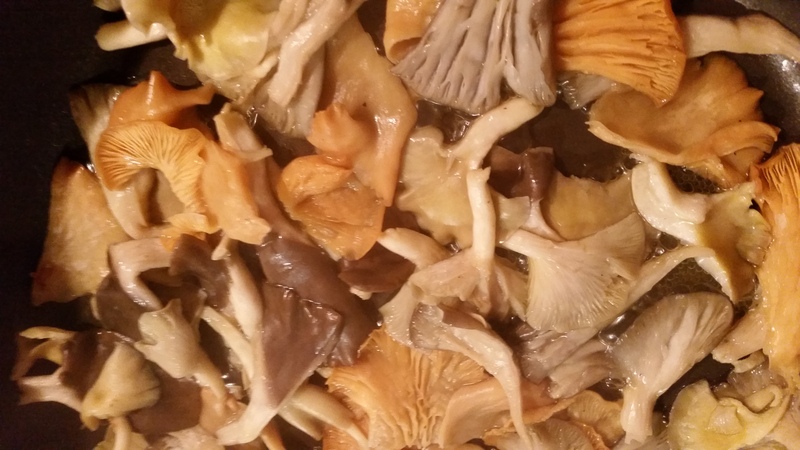 Do not remove the pan from the heat and pour out the moisture that collects in the bottom of the pan unless your mushrooms were so water-logged (usually only happens with foraged specimens) that they were swimming in the water exuded. Be patient and just let the moisture sweated out evaporate. Once that moisture has evaporated you will see that your shrooms will start to look a bit drier. Now you do not want them so dry that they are sticking to the pan but dry enough that they no longer have that glistening sheen that was created when they were releasing their moisture. Oyster mushrooms after all sweated moisture has evaporated from the pan. Now is the time to add some butter or oil. Personally I prefer butter for the best flavor but if you prefer oil….well then that is your prerogative. After releasing their moisture, the mushrooms are eager to soak in something to replace what was lost. This is why you never want to add the butter/oil immediately to the pan with the raw mushrooms. Remember how I stated that after sweating out the moisture, the mushrooms will reabsorb the fluid left in the pan? Instead of ridding of all excess moisture and only taking in a small amount of butter or oil, the mushrooms will then absorb a watered-down butter mixture. That leads to that lovely slug texture that turns so many off to mushrooms in general. Add butter a little bit a time. Add a little butter (or oil) and increase the heat a little. If the shrooms soak it up immediately, like I know you are so eagerly absorbing this knowledge, add a little more. The idea is to add enough so that the mushrooms absorb the ideal amount but not so much that they are swimming in it. I tell people to add enough a little at a time so that you see that you are left with a slight film of butter (or oil) in the pan, not a pool. Once you have achieved ideal absorption, increase the heat a tad bit more to slightly caramelize the exterior of your shrooms. Once you have reached the desired doneness, remove from heat, and serve on a plate with a light sprinkling of kosher salt. I never salt my food but mushrooms are the one exception. That tiny bit of salt really makes the flavor pop. Eat as is or add to any recipe. ENJOY!!!!! Increase the heat a little to caramelize the exterior. Transfer to a plate and serve with a little sprinkle of kosher salt. ENJOY! Chicken of the Woods vs Real Chicken – The Showdown! Distinguishing the flavor profiles of differing mushroom varieties is like describing a wine: A basic guide. Why Make Mushrooms a Part of Your Daily Diet: The Amazing Health Benefits, That’s Why! Welcome to Fox Farm & Forage, LLC!